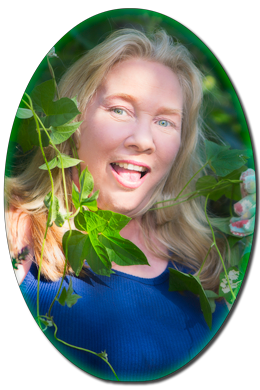 The morning glory vine I’m holding in the picture to the right looks benign. In reality, however, it is one of the banes of my existence. You see, it’s not my plant; it belongs to my neighbor. My neighbor, bless his heart, does not pay attention to his beautiful “little” vine. Ipomoea purpurea makes its way over to my yard from under the fence and systematically attempts to invade and conquer everything and anything it can. Yes, it is beautiful, but it can take over in a heartbeat and smother all that you hold dear in your garden. a plant that is not valued where it is growing and is usually of vigorous growth; especially : one that tends to overgrow or choke out more desirable plants. Ms. Morning Glory is definitely not welcome in my garden! Last summer I didn’t pay attention to the vine as much as I should have and it took my husband and me more hours than I care to admit to get rid of it. It ran though bushes, it ran up the trees. Hell, it would have strangled my dog if he’d have sat still long enough. I vowed at that time to stay on top of the rotten weed the next Spring. So here I am; May 26th – “next Spring.” Arrrggghhh…it’s baaaack. Morning glory owes its success as a weed to thick, fleshy roots which travel long distances just under the soil surface. Controlling it lies in removing the root system. You can remove large quantities of roots by hand weeding and it’s best to have a pair of clippers handy to cut the thick vines which will most likely be twining around the trunks and branches of trees and shrubs. Be sure to pull all the vines down out of the trees or you’ll be left with an unsightly mess. Repeatedly check back where you dug out the roots as any bits and pieces of roots left there will continue to sprout and grow. You must be vigilant and persistent to keep it from growing back. Can you use chemical eradication, you ask? After all, it is a weed, right? As a Master Gardener, I only use chemicals as a very, very last resort. My battle with morning glory is waged in hand-to-vine combat. Remember, too, that anything that chemical touches will die, including the plant the vine is twining around. Also, if the plant is your neighbor’s, it is not yours to kill. You may get into a spot of trouble should you engage in “planticide” of another’s. Better to maintain a healthy relationship with your neighbor and just keep digging. 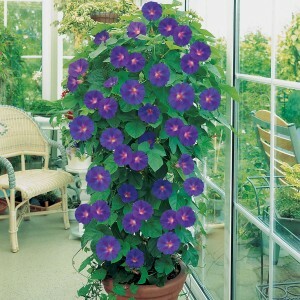 Morning glory is a beautiful plant. I get it. If you feel you must have it in your garden, there are ways to grow it, enjoy its beauty and still be a good neighbor. Plant it in a pot and be sure to keep it contained. If your pot is outside, keep your weedy friend from escaping by trimming it up periodically. Trellises are also good vehicles for morning glory but again, keep an eye out for the shoots that are making a run for your neighbor’s yard. Morning glory re-seeds, too. Check the ground around the pot or trellis for any new shoots coming and then dig those little buggers out before they get a hold of anything. The heat has driven me inside this afternoon. But I know my nemesis is still out there twining its tendrils around my plants and laughing at me. Yes. Laughing. But it is I who will have the last laugh when I dig, cut, and tug another day to complete my quest to say good riddance to the plant-which-is not-valued-where-it-is-growing.